Profile is extending special pricing to Morgantown Chamber of Commerce members and their employees/families. They can enjoy 50 percent off of Profile yearly memberships. People are more successful at reaching/maintaining weight loss goals with a coach. Profile has Certified coaches and the necessary foods to ensure success! 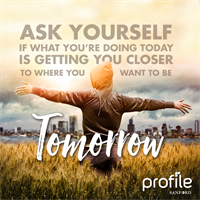 Profile's programs were designed by physicians, nutritionists and scientists at Sanford Health, one of the world's largest non-profit healthcare systems. Special pricing for Chamber members, their employees and their families.